Our local HMV is down to its last few days. Sunrise released another list of HMV locations that they will be taking over. Sadly, my local soon-to-be-former HMV is not on the list. It may still make it, but its getting down to the wire. Truthfully, I wasn’t a regular. Probably shopped there a few times a year and would browse a bit more often, but I think there was some comfort in knowing the local mall had at least one music store. 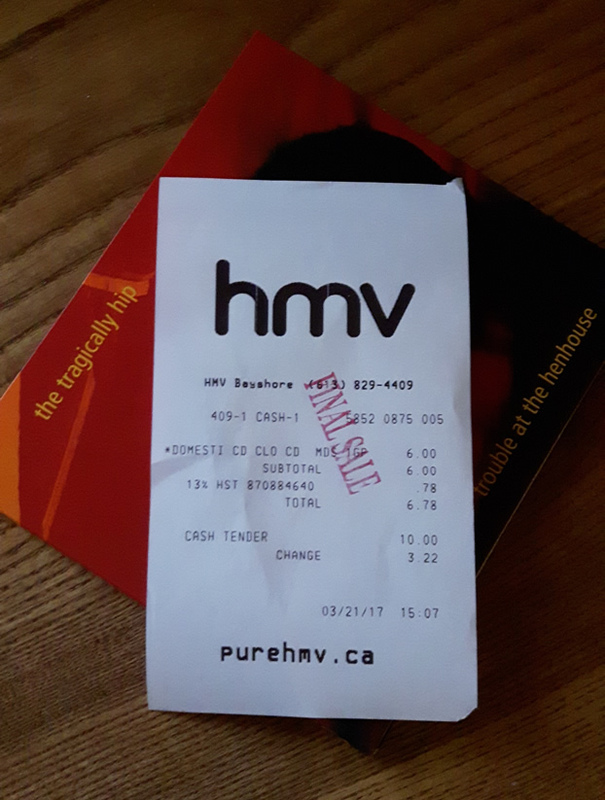 I felt compelled to make one last visit and make my last purchase – The Tragically Hip, Trouble At the Hen House for six bucks. I had a chance to talk to one of the two people working there. The Manager told me he was still not sure that this location would become a Sunrise store – but he was hopeful. We talked music and the changing times in the industry that lead to HMV’s demise. I asked if I could buy one of the HMV staff shirts. The young woman working the cash with him said “That would just seem kind of wrong. We should just give you one.” With that, the last box of staff shirts appeared and I got to pick one out. This is as close as I’ve ever been to working at a record store – I’ll take it. That’s when it became clear to me why a music store closing is more significant than a shoe store or a pharmacy or a trendy clothing store closing its doors. For many of us, music is our life-blood. We remember where we were and what we were doing when we heard certain songs. We remember our first album and our first concert. We remember the lyrics to songs and will continue to remember these right to our last breath. So to see a store close that gave us access to all of that is a sad moment. The young woman who served me didn’t give up trying to get a job at HMV. Not because she couldn’t land a job anywhere else. There were lots of other stores in the mall hiring. She wanted to be connected to music and this was the best way she could do it. I remember HMV on Yonge Street in Toronto. You could go to Sams, Sunrise and HMV in an afternoon. HMV was never a go to store for anything unique, but it filled a need for a period of time. That time has come to an end. I’m keeping my fingers crossed for a new Sunrise – and hopefully one close to home.